Dentures are artificial teeth used to fill in the spaces created by missing teeth. Aside from aesthetic appearance, dentures will help a patient with chewing, normal speech, facial muscle support, and avoid the shifting of surrounding teeth. Dentures can be created to fill the place of one missing tooth, several teeth, even all of patient's teeth depending on the nature and reason for their tooth loss. There are two types of denture options: complete and partial dentures. Depending on your needs, we can have our denturist assist you with the best option for you. Instead of having an entire set of new teeth, partial dentures replace missing teeth with implants to give you a complete smile. Partial dentures are fabricated teeth fixed to a pink gum-like base that clicks into your upper or lower palette. Like a retainer, they are removable and can be easily cleaned this way and can be a great alternative to implants. They are a great solution if most your natural teeth can be kept in healthy condition. 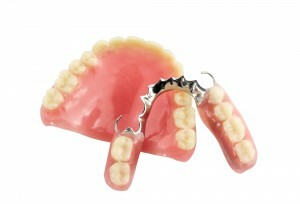 We offer cast or acrylic dentures, please contact us for more information. Complete dentures are for those who need a completely new set of teeth. They are also called “full dentures” and are used when all your natural teeth are missing. Complete dentures are removable as they are held in place by suction. Dentures can also be done in conjunction with implants to improve stability of the denture.